Intoxicating scenery, extraordinary experiences and idiosyncratic locals. Iceland’s mesmeric appeal has become increasingly widespread in recent years. Yet there’s no escaping the fact that it’s not a budget holiday destination. We’ve always believed that the old adage of ‘you get what you pay for’ rings true for Iceland as it delivers a knock-out punch time and again for visitors. On this basis, our holidays are designed to exceed your expectations at the best possible value. And, we’ve been doing this a long time, over three decades in fact, meaning that we can adapt and tailor a holiday to suit your budget and time-frame. “Iceland is an amazing place. It was just easy from start to finish. From booking, to picking up the car, to tailoring every days activities. The iDiscover was amazing and pretty essential. It enabled us to go and find hidden gems that we would otherwise have driven past”. Read on for our top tips for managing your budget in Iceland. The scenery is free! In some instances, like the Highlands, reaching it may require a logistical commitment, but many of Iceland’s most dazzling sights are easily accessible from the Ring Road, including Seljalandsfoss, Skogafoss, Jokulsarlon and the Golden Circle. You don’t even have to leave the car – but you didn’t hear that from us! Optional activities range from the thrilling to the jaw dropping. Yes, you have to pay for these, but they provide exceptional experiences in return including some that are entirely unique. Whether you raft a glacial river, encounter the giants of the deep on a boat trip, experience the unique gait of the Icelandic horse or venture inside a volcano – talk to our team to help you select the best for your budget. Size doesn’t always matter. Travelling to Iceland in summer, you needn’t hire a 4WD for exploring, though they are fun. A 2-wheel drive does the job perfectly, unless you wish to venture into the Highlands. We recommend opting for a VW Golf over a VW Polo purely for your comfort whilst driving around. Speak to our team to help weigh up your choice of vehicle. Plan ahead. If you’re working to a strict holiday budget, consider upgrading to a half-board option where available. All our holiday prices include breakfast as well as rooms with private facilities, but pre-booking dinner too is a great way to manage your costs upfront. Most travellers would agree that insider knowledge is priceless. Well, this is exactly what you get when booking one of our self drive holidays, courtesy of iDiscover. 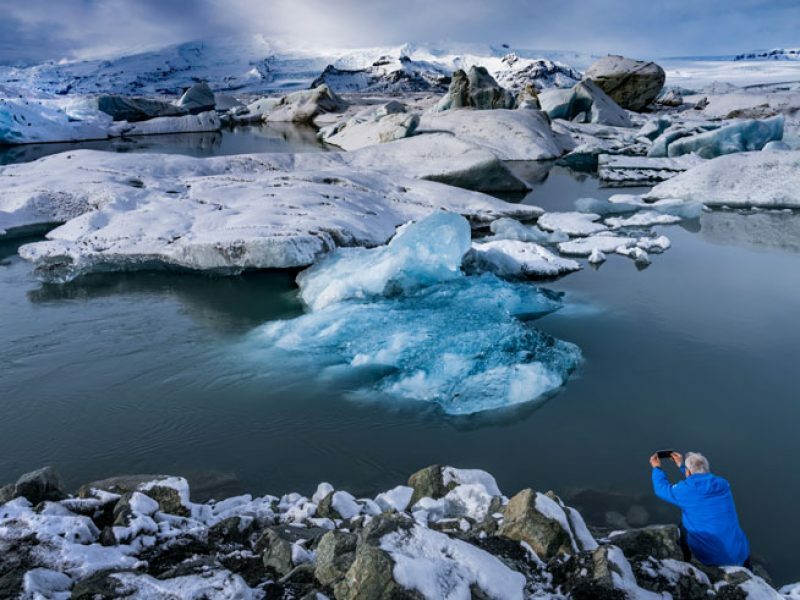 We’ve crammed over 35 years of Iceland expertise into this digital travel companion that allows you customise places to see as you’re navigating your way around the island. An added bonus. Booking with us, you’ll also be given our Iceland Bonus Card providing savings of 10-30% on selected restaurants, museums and shops around the country. Using first-hand knowledge and relationships spanning more than 34 years, our Travel Specialists will work with you to design an authentic experience to suit your budget and timescale. We can create an itinerary from scratch or, in most cases, adapt our existing holidays. And at a time of fluctuating exchange rates, our ‘no surcharge guarantee’ ensures you’ll not pay more once you’ve booked. Plus no fees on credit card transactions. Contact our team today to start planning.